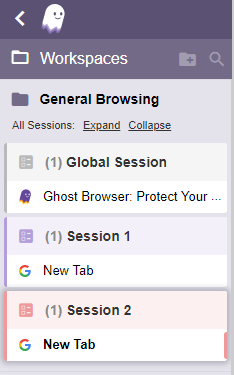 A Session in Ghost Browser is a colored tab that is isolated from the other tabs in your browser so you can log into a website with multiple accounts. Each Workspace can have as many as 25 Sessions. There are two kinds of Sessions in Ghost Browser. 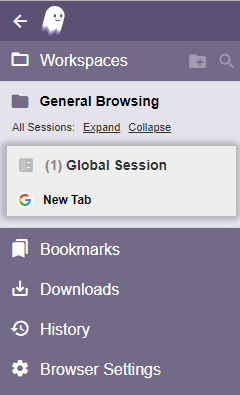 The Global Session is the first Session you see when you open the browser. It has gray tabs. The Global Session shares cookies among all Workspaces. For example, if you want to be logged into your personal Twitter account in every Workspace, you can use the Global Session to achieve this. Then to sign into a different Twitter account you manage for work in the same Workspace, you would sign in via one of the colored Session tabs. The other kind of Sessions are colored Sessions. They are isolated from each other AND by Workspace. If you log into a Pinterest account in a purple Session in one Workspace, you won't be automatically be logged in to that same Pinterest account when you open a purple Session in a different Workspace. The Sessions shown below are all under the General Browsing Workspace. To open a new Session, click the + sign on the right side of the Workspace. In the example below, we are adding a Session to the General Browsing Workspace. 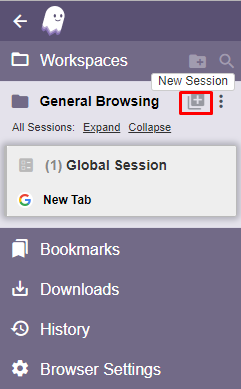 You'll notice that a new Session tab with a different color opens, the first color being a purple Session tab. This color coding on Session tabs will help you easily identify which Session (or client) you're working in. Here are some examples of how you can use Sessions to be more productive. Let’s say that you want to open five different Twitter accounts in the same browser window. This simply isn't possible in other browsers. With Ghost Browser, you can open as many accounts on the same website as you want. To open five Twitter accounts, simply open five different Session tabs and sign into your Twitter accounts in each one. Or maybe you want to run a Google search with ‘clean’ search results (search engines usually show results based on your past searches). A new Session in Ghost Browser lets you see completely unbiased search results. These are only a couple of ways you might use Sessions. The only limits are your imagination! Once you have your Sessions set up, you can save a group of Session tabs, with the login information stored into a Workspace so you can come back to that TabList any time with one click and you'll be logged into all of your accounts.